In front of 78,133 fans in the Mercedes-Benz Superdome in New Orleans, Louisiana, Brock Lesnar defended the WWE Universal Championship against Roman Reigns. The Big Dog, who main-evented his 4th consecutive WrestleMania this year, was in the minds of many of the WWE faithful, the hand-picked next champion. WWE fans, who for the past 4 years have expressed their displeasure with Roman Reigns seemingly becoming the new face of WWE booed the former WWE Champion with a vigor and diligence that could be felt throughout the crowd and radiated through the television screen to all those watching live on Pay-Per-View and on the WWE Network. The level of resentment the WWE Universe has had towards Roman Reigns has been evident since his Royal Rumble 2015 victory and has not ceased despite the endorsement of his family member and WWE Legend the Rock, a short-lived reunion of one of the most popular factions in WWE history, the Shield, and even a storyline revision to make Brock Lesnar come across as not caring about the fans. 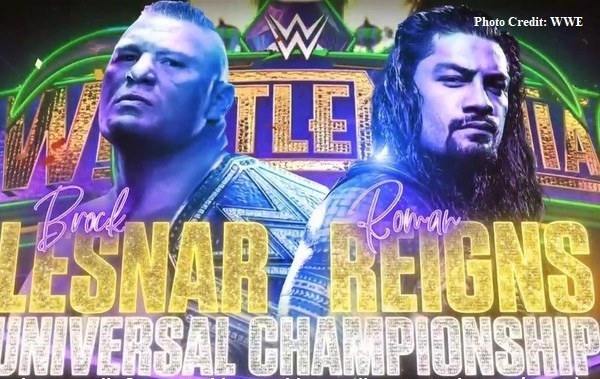 With Reigns’ victory over the Undertaker at the show of shows in 2017 and Brock Lesnar finally defeating Goldberg after 3 unsuccessful confrontations, it seemed inevitable that the leader of the Roman Empire and The Conqueror would clash at the biggest Sports Entertainment event of the year and that Reigns would become the next Universal Champion. Well, as history will show, only 1 of these 2 scenarios came to pass. 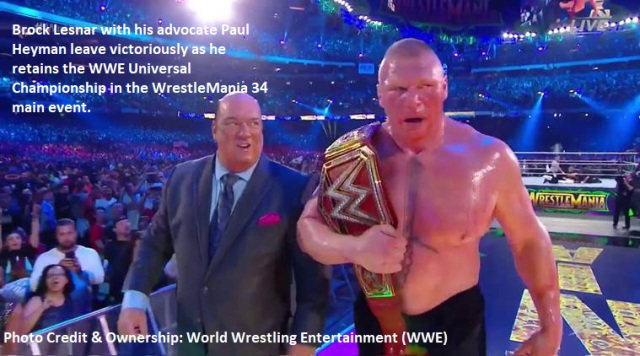 A match that this writer considers to have been quite entertaining was overshadowed by the jeers of the crowd who had heard that Brock Lesnar was in negotiations with UFC, and possibly leaving WWE after WrestleMania. With these rumors, came the likelihood in the fans’ minds (including this writer) that Roman Reigns would undoubtedly become champion. Over the past 18 months, no one had survived one F-5 from the founder of Suplex City, and on this night Roman Reigns would kick out of multiple F-5’s including one through the announce table. With each kick out by the challenger came more boos as it seemed as if a Roman Reigns comeback victory was a forgone conclusion. In shocking fashion Brock Lesnar, after kicking out of two spears by The Big Dog, would deliver a 6th F-5 to his bloody challenger which led to Lesnar retaining the Universal Championship to the surprise and delight of most watching at home and the almost 80,000 in the Superdome. As the shock of this unlikely main event outcome resonated throughout the WWE Universe, it would be announced the next day that Brock Lesnar re-signed with WWE and that he would defend the title at the “Greatest Royal Rumble” event on April 27th (The time duration on Lesnar’s WWE contract extension has not been made public as of this story being written). WWE Smackdown Women’s champion Charlotte Flair got arguably the biggest victory of her career over the previously undefeated Asuka, ending her undefeated streak that began in 2015. Nia Jax won the WWE Raw Women’s championship in what this writer feels was a long overdue title win. Nia Jax has been on top of her game for over a year and it can be argued that she was deserving of winning the RAW Women’s title at WrestleMania 33 last year. The Undertaker, after a year-long absence, and a month of insults by John Cena, returned and was victorious over the former Doctor of Thuganomics and 16-time World Champion, improving his amazing WrestleMania record to 24-2. Former UFC Champion and latest blockbuster WWE signing Ronda Rousey was successful in her WWE debut in a mixed tag team victory with partner Kurt Angle, defeating the Authority (Triple H and Stephanie McMahon). Daniel Bryan made his long awaited return to the squared circle after being medically cleared by WWE doctors. He and WWE Smackdown Commissioner Shane McMahon defeated Kevin Owens and Sami Zayn. Daniel Bryan looked as if he had not lost a step and the following week he resigned as Smackdown General Manager officially returning to the WWE active roster. He would main event “WrestleMania Smackdown against WWE Champion AJ Styles who was also a winner in his WWE title defense at WM34 against Shinsuke Nakamura, who in stunning fashion turned heel after the match. In the main event Roman Reigns was unable to overcome six F5’s by the conqueror, as the WWE decision makers finally truly did what was ‘BEST FOR BUSINESS’ and we can say that STILL ((Paul Heyman voice)) … THE REIGNING, DEFENDING, UNDISPUTED UNIVERSAL HEAVYWEIGHT CHAMPION, BROCK LESNAR!